Home Unlabelled Report .. 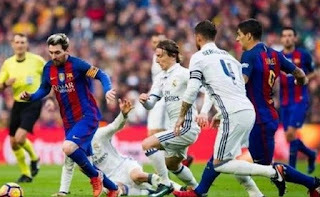 In the last 30 years .. 3 finals in the Classico Cup .. History equates Real Madrid .. and a negative number of "Messi"
At 10 pm on Wednesday at the Camp Nou, referee Matteo Lahouz announces the start of the match between Real Madrid and Barcelona in the first leg of the King's Cup final. The match between the two teams is the twelfth in their meetings in the King's Cup, Spain - during the last 30 years - In view of the history of confrontations between the giants of Spain, we find that the Royal team outperform the Catalan team with a score of 4-3, while the equalizer 4 clashes between the two teams. The two teams met in the final of the season 89/90 and saw the first loss of the Royal team 2-0. The semi-finals of the 1992/93 King's Cup combined the two teams, equalizing the first game with a goal each, while Real Madrid won the return game 2-1. During the 96/97 season, the two teams met in the Round of 16, Real Madrid lost their first encounter at Camp Nou with a 3-2 draw and a 1-1 draw. The final match of the 2010/2011 season between the two teams and the match was held at the Camp Nou and ended in favor of Almernji 1-0. The quarter-finals of the King's Cup 2011/12 draw between Real Madrid and Barcelona Real Madrid lost the first leg at home 2-1, and tied the duo in the second leg 2-2. In the semi-final of the 2012/13 season, the draw was a 1-1 draw at the Bernabeu, and Real Madrid won the match with a 3-0 win over Portugal's Cristiano Ronaldo before Rafael Faran lifted the score to 3. The final final between the two teams in the Cup was in 2013/2014, Real Madrid won 2-1. Barcelona's Lionel Messi has not been in Real Madrid's squad since joining Camp Nou in the summer of 2005.